In my last blog article I talked a bit (and showed some pictures) of the scooter and costume efforts in past Mad Bastards. 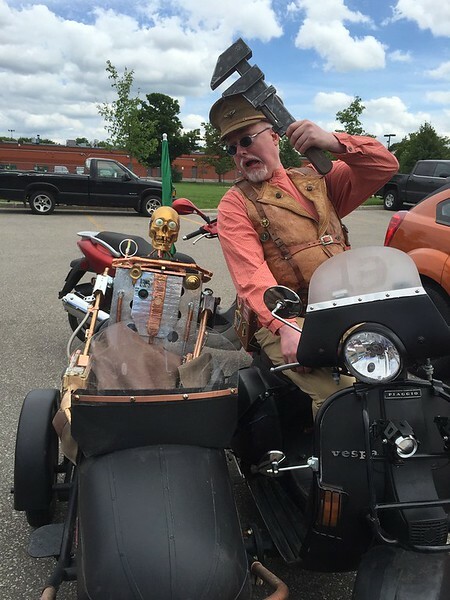 Last rally for example, I not only steampunked my Vespa/Sidecar rig, I built an entire life size steampunk robot to ride in the sidecar. Articulated body, lights, moving gears and all. 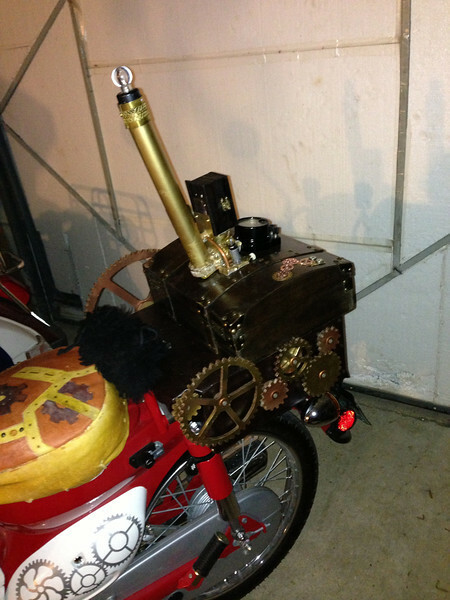 I'd done a steampunk theme the rally before with a loaner Sym Symba- doing a hand tooled leather seat cover, and a fake steam engine that went on the back of the luggage rack, again with moving gears and lights. So having done steampunk two rallies in a row... this year I decided to do something different. Also, I'm doing a team costume as my brother will be joining in on the insanity - as he has for the last few rallies. 1. You have to be able to wear the costume the entire day. This sounds deceptively simply, but when you are talking about being out for 18 hours on a scooter, both riding and running around like a crazed person (which is after all, part of the MBSR tradition), you would be surprised on just how many body parts you can chafe. Including on occasion ones belonging to innocent bystanders. And they really don't forgive you for that, even if you drop by later with baby powder and pie. So - have something reasonable to wear. 2. The costume has to be safe to wear. No long scarves, capes, or anything that can be caught in the rear tire for example. While the resulting decapitation would probably get you a few extra mad points, you might have some difficulty in collecting them at the end of the rally. Plus those of you with a really cool hat collection would need to find a new hobby, and you don't want that. 3. Plan for a variety of temperatures and conditions. This means with our lovely predictable Canadian weather that of course it will be a constant 18 degrees C., with no rain or wind and just the right amount of constant comfortable sunlight. Several years the temperatures have been low enough when starting off at 4:30AM that there is a touch of frost forming on the scooters. One of those years there is was a participant wearing a kilt. I'm pretty sure the combination of those two things led to the loss of several body parts he was particularly attached to. Or no longer attached to, as the case may be. You can then peel off the layers later on when the temperature climbs - and it can go from the edge of frost up to full on sweatbox summer over the course of the day. Which it did the year there was an entry with a gentleman wearing a full ape suit for the entire day. I'm pretty sure the results of the shower after the rally caused an entire hotel cleaning crew to quit outright. So bring rain gear, warm layers, warm weather and cold weather gloves, sunglasses, sunblock, etc. 4. It's all about the funny photos, and the laughs you get along the way. I still get a laugh thinking of the year we rode behind two guys in viking outfits - they were chanting, singing, waving plastic axes, had boxes of "Loot" on the backs of their scooters and looked like complete and utter nutbars. You want something that adds to the carnival feel of the whole event. It's all about the laugh, the pose for the perfect comedic shot. Half the fun is just in the sunday morning slideshow, showing everyone in their finery acting like proper MBSR lunatics. It's like Halloween on steroids, but combined with two wheeled fun... and what could be better? So think ahead, not just for the immediate sight gag... but funny photos you can take along the way. So what did I come up with for this year? Right.... following my own rules it had to have an element of humour. It had to be something at least somewhat original in terms of the rally. Though some classics do repeat. It had to be something allowing for comedic photos along the way. And it had to work as a team costume. The Away Team. Star Trek redshirts. With this as a starting point - I began to think... what would the Star Trek redshirts do if they had actual vehicular transportation instead of being abandoned without food, water, warm jackets, etc - on a hostile alien planet with murderous creatures. Things like matching helmets, jackets and props were obtained. 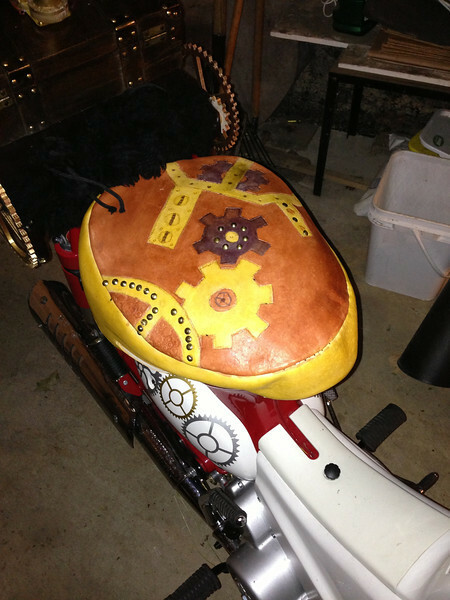 The bikes will have added lighting and various vinyl decals added to give an "Away Team" feel to the whole shebang. I even added an additional crewmember for the comedic value. A skeleton in a redshirt we'll be calling "Bones". I figured it would save time if we brought someone pre-killed. I'll be adding in the occasional teaser picture of the costume prep for this year - but I'll leave a lot of the details out of the public eye until the rally day itself. And I fully expect to be laughing, amazed, and impressed by the efforts of all the other entrants in the rally.... some people leaving bits of home made costume in an easily followed trail for 600km, to the people who look like they stepped out of a major Hollywood production. There will even be the odd one that will make you stare and think - and you'll get the joke several hours later and cannot stop laughing. Which again feeds into the whole lunatic thing. And being part of a lovable group of utter lunatics - is after all - pretty much the entire point.